With the stock market nishing down more than 5% in 2018, real estate in Steamboat was a safe haven investment with home prices up 4.3%. Single family homes appreciated a whopping 10% to a median sales price of $814K, while condos/townhomes increased in value to a median price of $398K. We started 2018 with low inventory, so this appreciation isn’t surprising; however, total sales volume outpaced projections with the overall market volume up 7% to $526M, the most activity of any year in the last decade. Lack of inventory, especially under $1M, remained the market's biggest challenge. As we read national forecasts about 2019, there are growing concerns of a real estate slowdown. A turbulent stock market and a lack of a ordable housing are already impacting many markets. Mortgage rates, while down in December, are still up nearly 1% from a year ago, making owning a home more expensive. 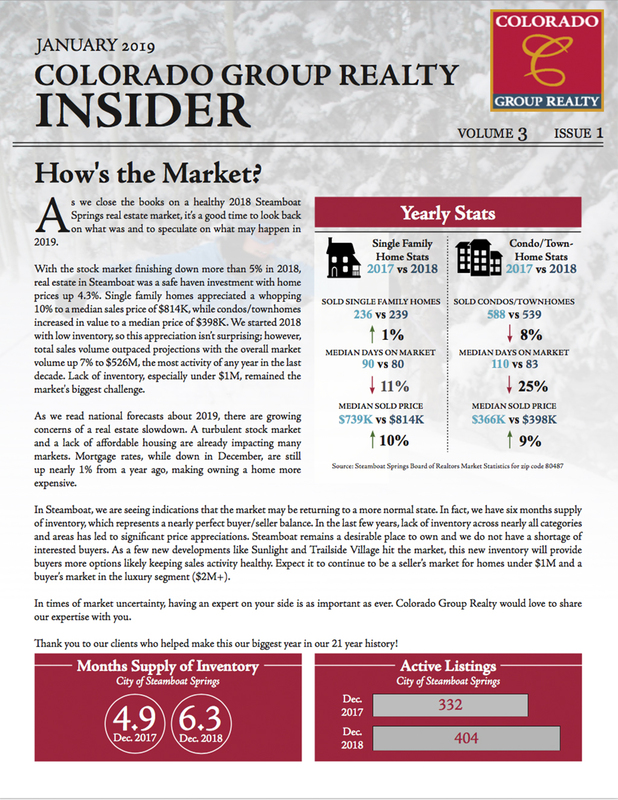 In Steamboat, we are seeing indications that the market may be returning to a more normal state. In fact, we have six months supply of inventory, which represents a nearly perfect buyer/seller balance. In the last few years, lack of inventory across nearly all categories and areas has led to signi cant price appreciations. Steamboat remains a desirable place to own and we do not have a shortage of interested buyers. As a few new developments like Sunlight and Trailside Village hit the market, this new inventory will provide buyers more options likely keeping sales activity healthy. Expect it to continue to be a seller’s market for homes under $1M and a buyer’s market in the luxury segment ($2M+). In times of market uncertainty, having an expert on your side is as important as ever. Colorado Group Realty would love to share our expertise with you. ank you to our clients who helped make this our biggest year in our 21 year history!